Der Artikel Hammer King: Poseidon Will Carry Us Home wurde in den Warenkorb gelegt. 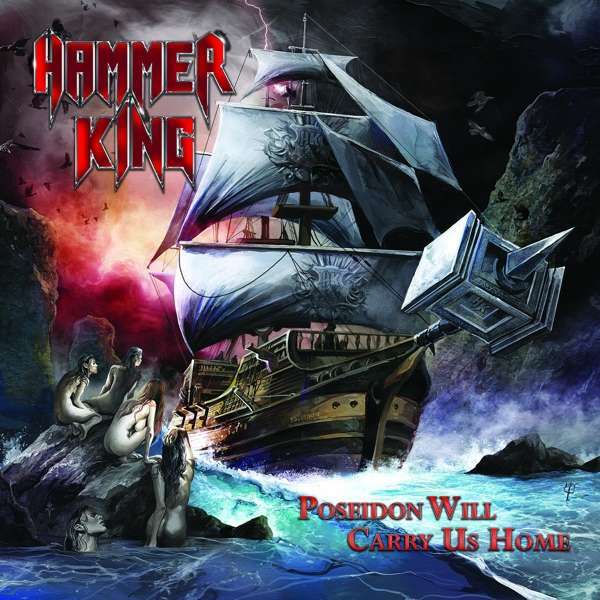 Crucial third album from German classic power metal outfit Hammer King, Poseidon Will Carry Us Home features a series of taut, but also mighty songs, including their most adventurous feat to date: The “Nautical Trilogy” detailing the epic adventures of “The King” himself. Simply a brilliant combination of melody and might, all wrapped up in a warm, natural production job by Powerwolf’s Charles Greywolf. - Hammer King’s debut album Kingdom of the Hammer King saw the light of day in 2015, with King is Rising following a year after. Both albums quickly established the German four-piece (featuring vocalist/guitarist Titan Fox V., guitarist Gino Wilde, bassist K.K. Basement and drummer Dolph Macallan) as a fresh, powerful force in classic power metal circles. After a fruitful studio session with Powerwolf bassist Charles Greywolf at his own Greywolf Studios, Hammer King has emerged with their pivotal third album, Poseidon Will Carry Us Home. Featuring 11 songs of pure and bombastic true metal, Poseidon Will Carry Us Home finds Hammer King honing in on their obvious strengths and expanding their sonic palette at the same time. The band’s trademark gallop and twin guitar interplay is complemented by the smooth, clean vocal delivery of Fox V., who turns in several spirited chorus choices on “Warriors of Angelhill” and “Where the Hammer Hangs.” Traditional cuts like “The King Is A Deadly Machine” and “Battle Of Wars” are simply German metal at its fist-pumping best. However, it is the “Nautical Trilogy” that marks the greatest creative leap for Hammer King. Featuring the opening title track, “At the Mercy of Waves” and “We Sail Cape Horn,” the “Nautical Trilogy” is where Hammer King’s penchant for epic songcraft and heroic melodies takes flight, immersing the listener deep into the perilous sea as the band details the journey of “The King.” Hammer King’s immense, unyielding faith in The King is rewarded across Poseidon Will Carry Us Home. The formidable challenge of the third album has been met. Come along to the court of The King and bask in the glow of Hammer King’s greatest triumph to date. Long live The King!